The rebs had selected this place to check our advance. The road run about east to west, and a small creek run north and south, with a bridge across it, and not much water in it. The creek made pretty good breast works when we were able to reach it. The 30th was on the north side of the road in a piece of open timber, on the west of the creek, and a big open field on the east of the creek. On the south of the road there was a good deal of timber and brush, on the south of the road there was an open field. The creek made a turn to the east after passing the bridge and throwing the open field on the south of the creek. On this side of the road the Confederates came down much closer, being protected by the brush. The dead lay thick about the creek. The 30th advanced to the creek and took shelter in it, It made very good breast works. The battle lasted several hours, when the enemy retreated toward Jackson. We had a man in Co. C that was an awful coward by the name of Johney Boyd. He would always dodge out when a fight was on. My brother, David, was Sergt. Maj. Of the regiment. Capt. Wilson requested the Sergt. Maj. To keep behind Co. C and see that Boyd went into the fight. He had to draw his sword on him several times, but he put him into the fight, after getting into the bed of the creek for protection. The boys would get up to the front where they could see to shoot, but Boyd would keep well down in the bed of the creek to load his gun, and instead of getting up to the front to see where to shoot, he would stay down in the bed of the creek, tuck his head down, and throw his gun up and shoot. He came very near killing some of the boys that was up at the front. One of the boys gave him a cursing and told him he would put a bullet through him if he didn't stop that kind of shooting. The Capt. never forced him into a battle again for fear he would kill some of the boys. He made him do other duties that were useful. He would tremble as though he would fall dead in his tracks. Here is the question: Could he help that? After burying the dead and caring for the wounded we took up the march for Jackson eighteen miles distant. Passed through Clinton (a college town). We reached Jackson, Miss., on the 14th, where the Rebs were in considerable force. 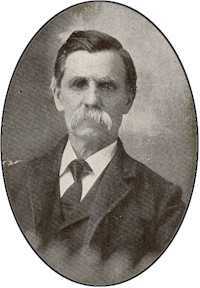 W. F. Wilton, Co. K. The "Yank" that killed the sheep at the close of the Battle of Jackson. He lost an arm at the Battle of Champion Hill. The reader will notice that on this campaign when we reached a place there was no parleying, but we formed a line of battle and made an attack immediately. The reason for this is plain: When we left Milliken's Bend we cut loose from all communications north, and were fighting our way around to some place near Vicksburg, on the Yazoo river, which proved to be a success later on. Consequently the enemy was attacked without delay, and Jackson was taken without very much hard fighting. Perhaps less than fifty were killed. A good deal of artillery was taken, with other military stores. The Confederates destroyed a good deal before the evacuated the place. There was a cotton factory there that had not stopped during the fight. After the surrender, Grant and Sherman visited the factory and watched them work for awhile, making tent cloth, with C.S.A. printed on each bolt. After watching them work for awhile, Grant told the operators they could leave and take all they could carry. The most of the workers were girls. (Grants Memories). About the close of the battle a bunch of sheep came running by, and Co. "K" "30" boys, took one in; and had a change from sowbelly to sheep. W.F. Wilton, of Co "K" now living at Huey,Ill., was one of the sheep boys. This was the 14th, and at Champion Hill, the 16th he lost an arm. Jackson was a very nice town, and it is the capitol of Mississippi. The writer was there in 1913 and found the place much improved, A new state house had been built. Pearl river is a short distance to the east. We camped near Jackson, the night of the 14th. 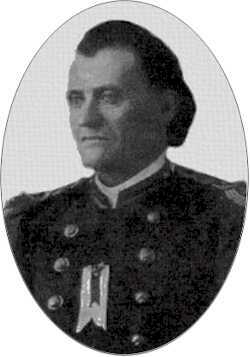 On the morning of the 15th we changed our course for Vicksburg, about fifty miles due west. We passed through Clinton, the college town, and camped on Baker's creek.